We took our time again leaving Little Farm on the River RV Resort on Friday because we had another short drive of only about 1½ hours to our next destination at Caesar Creek State Park near Wilmington, OH. Caesar Creek SP has always has been a favorite place of ours. It is located northeast of Cincinnati, and it is about 5 hours from where we used to live in Pittsburgh. We used to camp there on almost every long holiday weekend. One of the things we like about Caesar Creek is the widely-spaced, grassy sites. Another thing we like is the fact the place us usually pretty empty during the week. 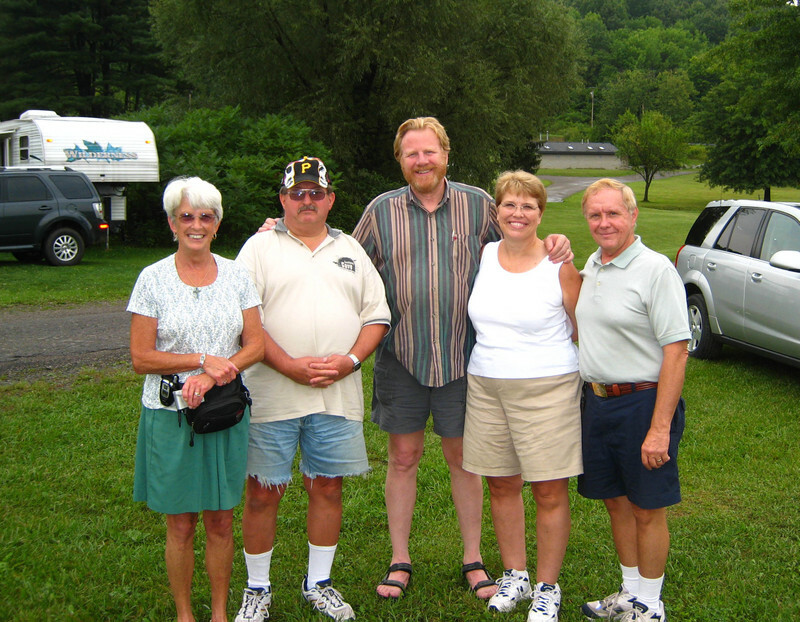 In fact, Caesar Creek, along with some of the other Ohio state parks, honor Passport America from Sunday through Wednesday nights for half-price camping in order to help boost business during the week. We pulled into Caesar Creek shortly after noon. Caesar Creek, like most Ohio state parks, has only electric hookups. There are spigots about every 8 or 10 sites where you can fill your fresh water tank. The electrical hookups are 20/30 amp. 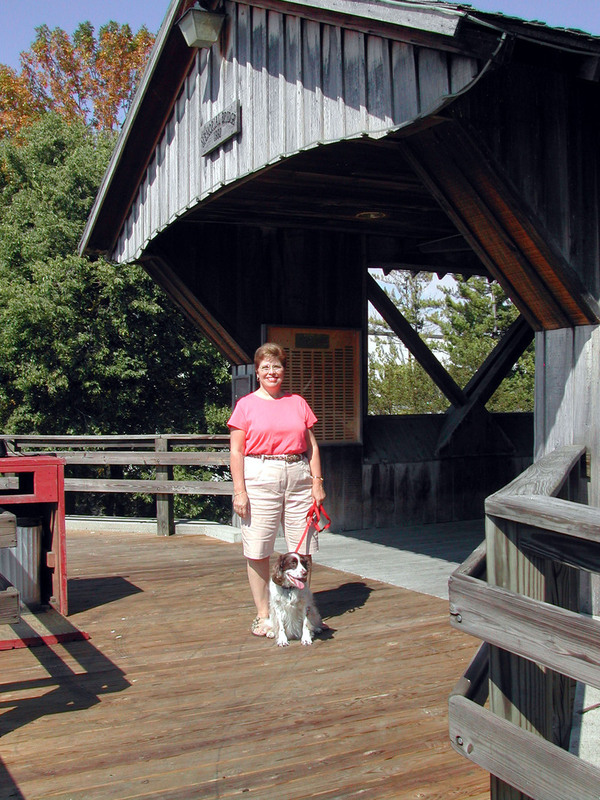 When Margery made our reservations for this stop, however, she noticed a number of the sites have been designated as tent sites. When we arrived, we saw sections where the electrical boxes had stickers on them that said "20 amp only." Paul's theory is some of the underground electrical cables for the 30-amp circuits have gone bad, and budget shortages have prevented replacing them. Therefore, the 30-amp service to those sites has been shut off the sites are only used for tenters. The tent sites are clearly indicated on the reservation web page, so you don't have to worry about arriving to find out you only have 20 amps. The roads and pads at Caesar Creek are paved. Most of the pads are rather short, and some of them also have a bit of a slope from front to back. The one we had this time was a little low in back, but at least we didn't have to put blocks under the rear wheels like we have had to do on a couple of occasions at Caesar Creek. Although Caesar Creek is usually quiet during the week, it is close to both Cincinnati and Dayton, and it can be very crowded and zooy on holiday weekends. 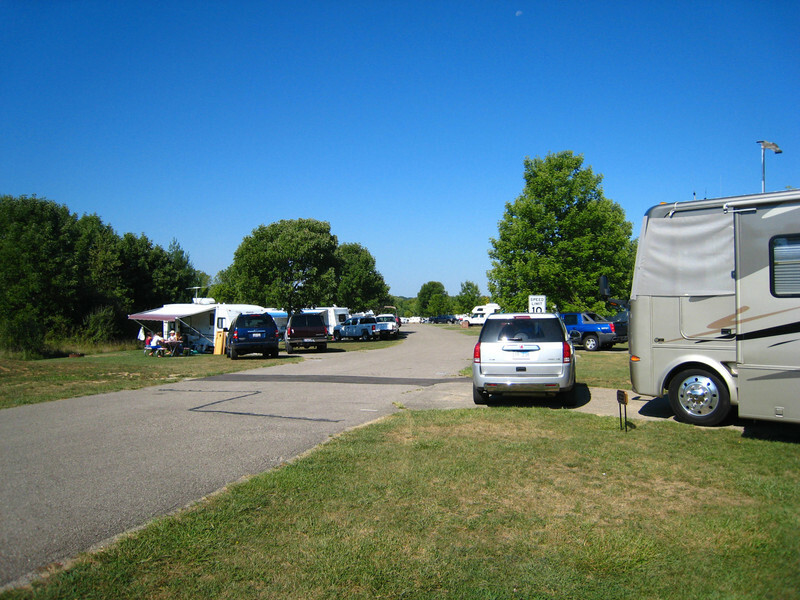 The size of the crowd varies on regular weekends during the summer, but the campground is usually nearly full. This time, however, the campground was only about half full. The next photo shows some of our neighboring sites, and you can get an idea of the size of the crowd. The campground emptied out on Sunday, and we pretty much had the place to ourselves the rest of our stay. The campground was about half full on the weekend. The weather has been getting a little cooler as we head north, and a cold front went through just before we got to Caesar Creek. That was a good thing because we only had 30-amp electric. Daytime highs were predicted to be in the 70s to low 80s, and the lows were supposed to be in the 50s and 60s. When we got up on Saturday morning, it almost felt like fall. The fact that there are several large flea markets in the area is another thing we like about Caesar Creek. We used to go to two or three of them on a weekend when we had a stick house. Now we only go to one or two. After breakfast on Saturday, we headed to Caesar Creek Flea Market, which is located only about 5 miles from the campground down at the interstate exit. Caesar Creek Flea Market has both indoor and outdoor vendors, and they have a mix of new and used merchandise. We weren't aware of it until we arrived, but the flea market had a fire back in March that damaged part of the indoor area. Fortunately, the fire was extinguished relatively quickly, so the fire damage was limited to a fairly small area. Unfortunately, smoke spread throughout the entire indoor area, and all 7 buildings had to be closed for cleaning and restoration. Immediately after the fire, the market owners contacted the vendors and offered them all an outdoor space at no cost until the buildings could be restored and reopened. The outdoor portion of the market was only closed for one weekend following the fire. Building 1, which was the farthest from the area of the fire, was reopened in May, and Buildings 2 and 3 were just reopened in late July. They expect the remaining 4 buildings to open within another month or so. We first headed down the covered outdoor area toward the far end of the market. This is where most of the indoor vendors have temporarily relocated, and we recognized some of them from previous visits to the flea market. It was a cool morning so there weren't too many customers in the outdoor area yet. When we got to the far end of the market, we couldn't see any fire damage apparent from the outside of the buildings, but we could see dumpsters between the buildings. We also saw where work has been going on inside. We headed back toward the three buildings that were open and worked our way through those. The inside looked nice and bright after the renovations. Everything has been cleaned up and repainted, and all the pegboard dividers between the booths had been replaced. Margery stopped at her favorite used book vendor. He used to have a large booth that encompassed 7 stalls, but now he had one temporary stall in the recently reopened Building 3. Margery found several books by one of her favorite authors. Even though she has a Kindle reader, she still buys some hard-copy books because not everything is available in Kindle format. She was happy to be able to support one of her favorite vendors. Paul stopped at a vendor in Building 1 to check out electrical connectors, tools and hardware. He didn't find anything he couldn't live without, so we escaped without making a purchase. In addition to the indoor areas and a covered, outdoor area, there are also large vendor areas in the parking lot. After finishing up inside, we headed there next. By this time, it had warmed up significantly (Paul was wishing he had worn shorts), and the outdoor area was fairly busy. The outdoor area also has a food service area. There was a very good bluegrass band playing when we walked by on our way back to the car. After the flea market, we headed back to the campground for an afternoon of relaxation watching the Olympics. On Sunday, it was more relaxation watching the NASCAR race and more Olympics including the closing ceremonies in the evening. We also enjoyed watching the campground empty out as the weekend warriors headed back home. Other than the flea market, we didn't have any activities planned for Caesar Creek. We drove to nearby Lebanon, OH on Monday to stop at Walmart and Kroger. Kroger is Margery's favorite grocery chain, and the one in Lebanon is particularly nice. It recently moved into much larger building that used to be a K-Mart. On Tuesday, we had to run out to Lowe's in Wilmington to get materials for Paul to make a new tie-out chain for Freeway. The maintenance crew ran over the one we had with their mower while we were out on Monday and chopped it into little pieces. We use a custom-made tie-out chain that is shorter and lighter weight than the standard ones that are available because Freeway is so small. Paul puttered around doing a couple of maintenance items on the car and the motor home, but we spent most of the rest of our time at Caesar Creek relaxing and enjoying the peace and quiet. One of the advantages to an almost-empty campground is the opportunity to see wildlife. Paul saw a doe and her two fawns walk by at the end of the road on a couple of mornings; and on Wednesday evening, they paid a visit to the site next to us. We watched them graze for several minutes before they moved on. On Thursday morning, we packed up, hitched up the car, made a stop at the dump station and headed out to our next destination. We'll tell you where that was in our next post. It's been over 6 weeks since our last post because we haven't been doing much sightseeing since our first stop in Ohio's Amish country. After our last post, we returned to the Pittsburgh area for our originally-planned late-April visit. We had planned to stay 2 weeks, but we had to extend our stay a week because Paul needed some additional dental work. :( The good news is we got to spend more time with family. During this time, we traveled north of the city (for doctor appointments, visits, and for church) and back south to where Lora and J. Michael live 11 of the 21 days we were in Pittsburgh. 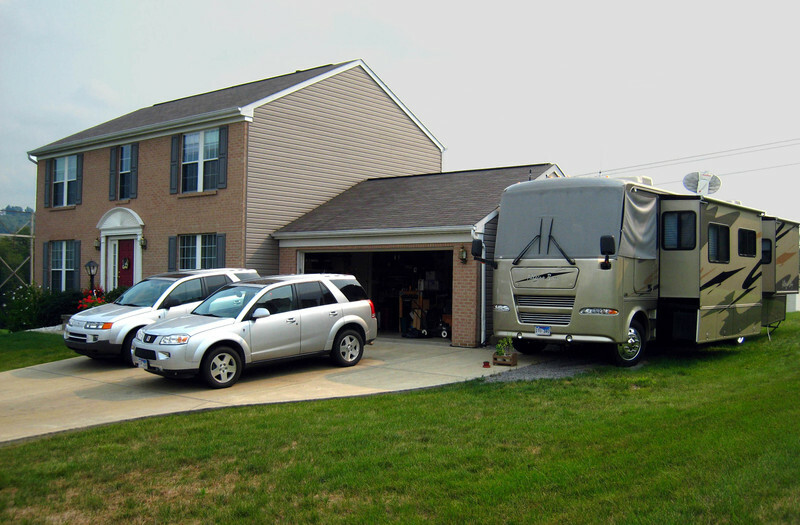 Since the kids moved south of Pittsburgh, we rack up the mileage on the car for visiting our parents, friends, and keeping doctor appointments; but it's wonderful to be able to park the motor home on the gravel pad next to their garage, which is something we couldn't do where they used to live in the North Hills. The ability to leisurely visit back and forth is great. Actually, this campsite is super! The hosts are wonderful, the laundry room immaculate, the meals superb, and we even had a campfire with timely updates on the Penguins' playoff game with Philadelphia! During our stay, Paul worked on several projects around Lora and J. Michael's new home, we met former co-workers for lunch, and we shared a lot of meals with the kids as Margery and Lora traded off being sous chefs for each other. Lora and Margery shopped and and enjoyed doing "activities of daily living" together. Something that has become somewhat of a tradition is their "girl thing" they call "Tea and Toes." They start with a pedicure at Salon Vivace in Treesdale. Although their cost is a little higher than others, it is justified by the fact that the French pedicures can last up to three months. Here are Lora and Margery being pampered at the salon. Following the pedicure, Lora and Margery went to The Johnston House in Cranberry Township. This is Margery and Lora's favorite tea room for its delectable sweet and savory offerings, the gracious service, and the beautiful house and gardens. Paul finished upgrading the parking pad beside the kids' house. They had a nice gravel spot there where they park their trailer; but with having to park the motor home a few feet farther away from the house to allow room to walk and to open the entry and storage bay doors, the pad was a little too narrow and we left some pretty deep ruts in their lawn when we visited last August. A few days before the end of our last stay in Berlin, we asked the kids to have a couple of tons of gravel delivered and we drove the 100 miles from Berlin to Pittsburgh in our car to level the gravel and widen the pad a few feet. After we arrived a few days later in our motor home, Paul lined the newly-widened pad with landscape timbers and filled in around the edges with some leftover gravel. There were lots of additional projects as well. Paul did some repair work on the kids' trailer, installed a couple of new outside light fixtures, installed a new toilet in the master bath, cut some new wooden leveling boards for their trailer, helped J. Michael and his brother install a new roll-out awning over their deck, fixed the hanger for the hummingbird feeder, and more. One of the things Paul misses about full-timing is the ability to work on various projects around the house. He enjoys the satisfaction of seeing things working properly and of seeing the improvements completed. There are always a few projects around the motor home, but it's not quite the same. We left Pittsburgh and headed back to Berlin for a few days. Of course, we stopped (again) at Der Dutchman for the salad bar for dinner and for the breakfast buffet we love so much. We also made stops at Sugar Valley Meats for smoked beef jerky and ham loaf mix, at Winesburg Meats for beef snack sticks, and at Lehman's Hardware. Our second stay in Berlin was originally scheduled for 9 days, but it was shortened to 2 because of our extended stay in Pittsburgh for Paul's dental work. 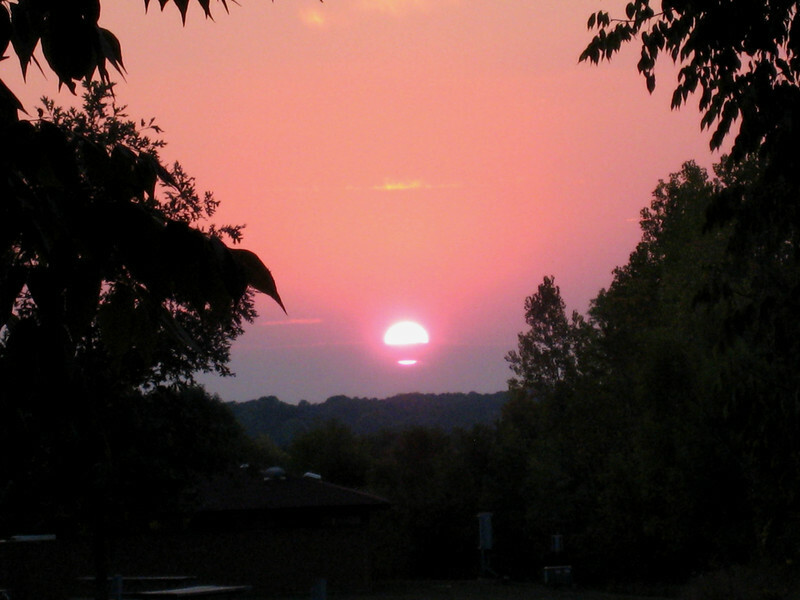 From Berlin, it was on to Caesar Creek State Park, a Passport America campground near Waynesville, OH for two weeks. Although it is very crowded on weekends and a little zooey on holiday weekends because it is so close to both Cincinnati and Dayton, it is still one of our favorite campgrounds. Being close to two large cities, it is primarily a weekend campground and it it is usually pretty quiet during the week. When we arrived Sunday afternoon, there were only two or three other RVs (other than the camp host) on our loop. The photo below shows the campground on Monday morning after we arrived... ...and the next one is the same view on Memorial Day weekend. The photo was taken fairly early in the morning before too many cars, bicycles, kids playing, and walkers were on the road. We have camped at Caesar Creek on Memorial Day and Labor Day for six years, and it is a good place to meet Lora and J. Michael now that we are full-timers, which is what we did this year. Lora and J. Michael arrived mid-afternoon on Friday and got set up. By early evening, the campground was essentially completely full. We hear on the news about people canceling trips because of the high gas prices, but since Caesar Creek is close to two major cities and since holiday weekend reservations need to be made far in advance to get in, most people showed up as planned. On Saturday morning, we headed to Der Dutchman Restaurant (sister of the one in Berlin) in nearby Waynesville for the breakfast buffet, then went to Traders World Flea Market a few miles southwest of Ceasar Creek. Traders World is a mostly indoor flea market; but on this beautiful, sunny day, there was a really good crop of outdoor sellers including a number of vendors some very nice hanging baskets, perennials, and flats of annuals. Lora and J. Michael bought a pair of beautiful hanging baskets of petunias for only $10 each. This was the first chance for Margery to do major walking (not fast-paced, but sustained walking AND standing) since her knee surgery. She did very well and only sat down a couple of times during the 2 hours we were there. Her knees held out so well that her feet started to hurt from all the walking. She probably should have worn tennis shoes instead of sandals. On Sunday, we went to the nearby Caesar Creek Flea Market. Of the several markets in the area, this is one of our favorites since they usually have a nice balance of new merchandise with the indoor vendors and used merchandise with outside vendors. This time, however, there were not many outside vendors in spite of the fact it was a magnificent day with bright sun and temperatures in the low 70s. Nevertheless, there was a good crowd of potential buyers drawn by the hunt for bargains. Although we always attend this flea market after a big breakfast and usually don't partake of their food (or "fair fare" as we call it), there is an excellent selection of "fair fare" with smells that are very tempting. The view below is looking toward the food vendors and the entertainment stage with a pretty decent bluegrass band. Again, Margery's knees did very well, especially since this was the second day in a row we did quite a bit of walking. We even rode our bikes in the evenings after the flea markets. We started staying over after holiday weekends at Caesar Creek until at least Tuesday even before we went full-time, so we could avoid the long lines at the dump station and so we could enjoy having the campground pretty much to ourselves again. Ever since Lora and J. Michael got caught waiting over an hour to dump several years ago (Caesar Creek has since built a second dump station to better handle the weekend crowds), they started doing the same. By Monday afternoon, there were only a few RVs left on our loop and we enjoyed the peace and quiet. Lora and J. Michael left on Tuesday and were the only ones at the dump station. As many times as we've been in this area, we never have visited the National Museum of the United States Air Force, which is located at Wright Patterson Air Force Base near Dayton. The museum was originally started as the Technical Data Section of the Engineering Division in 1923 at McCook Field. The museum was moved to Wright Field in 1927 and opened to the public in 1932. Construction of the first of the current museum buildings, which are designed to look like huge hangars, was started in 1970. The museum now includes 3 main buildings and an IMAX theater. The museum houses several hundred meticulously restored aircraft ranging from the first plane sold by the Wright Brothers to the U. S. Army Signal Corps in 1909... ...to the most recent, high-tech aircraft such as the B-2 Stealth Bomber... ...and the F-22 Stealth Fighter. The collection also includes numerous presidential planes (Air Force One) and many experimental aircraft. These are located in another area on the Air Force base and require a short ride on a shuttle bus. Unfortunately, we did all of our self-guided walking tour of the museum before we went to inquire about the shuttle, and it was already booked up until later in the afternoon so we decided to save that part of the tour for another visit. If you want to take the shuttle to see the presidential and experimental aircraft, sign up as soon as you arrive and fit the rest of the tour around your scheduled shuttle ride over to the base. There is also a guided tour of the museum available every day at 1:30 and a behind-the-scenes tour of the restoration area available on Fridays with advance sign-up. The aircraft are arranged in chronological order so you can view them in historical context. It's interesting to see how aircraft design has evolved over the years. You don't necessarily have to be an aircraft enthusiast to enjoy the Air force Museum. There are numerous displays of artifacts and photos giving the historical background of the various time periods represented by the aircraft from early flight, WWI, WWII, Korea, the Cold War, Viet Nam and Southeast Asia, all the way up to the present time. Many of the displays include not only artifacts and photos, but also a 3 to 5 minute video. Best of all, the museum is free, except for a flight simulator ride ($3.50) and the IMAX Theater ($6.00 - with discounts for seniors, students, and tours). The photo below Margery watching a video on dropping the atomic bombs on Japan. The plane is the B-29 bomber, Bockscar, that dropped the atomic bomb called Fat Man on Nagasaki on Aug. 9, 1945. A similar plane, the Enola Gay dropped the atomic bomb Little Boy on Hiroshima three days prior. Japan surrendered six days after the second atomic bomb was dropped. The display includes replicas of the bombs - Fat Man is the yellow one near the fuselage and Little Boy is the one to the left by the wing. Back at the campground, a few additional people came in on Thursday and a few more on Friday, but it was relatively quiet after the crowds on Memorial Day. On Monday, we will be leaving and heading west to the Escapees rally in Gillette, WY over the 4th of July and then on to Yellowstone. It's been quite a while since we posted news about our travels because we weren't traveling much and when we were, we weren't doing much sight-seeing. In early August, we were staying with our daughter and son-in-law, parked in the driveway of their new home just south of Pittsburgh. We visited with them, with family, and with former coworkers. We also visited doctors and the dentist. We both got good reports on all fronts. Margery also got new glasses and Paul got new contacts. We're all set. Paul had a long "daddy-do" list. He enjoyed being able to use his table saw again while working on some of these projects. The high priority project was installing French doors on the living room which was made into an office. The doors made a handsome addition. Paul was happy to get his hands dirty again, and it was nice of the kids to have a list of varied projects and allow us to be a part of this new step in their lives. Paul plumbed repairing the outdoor faucet, installed an ice maker in their refrigerator, carpeted the steps to the finished basement, repaired a couple of pieces of furniture, and fixed several closet doors so they worked better. Margery pitched in on kitchen and laundry duty so we wouldn't be too much of a burden on our hosts. It was great being together but also having everyone able to retire to their own space...the best of both worlds. 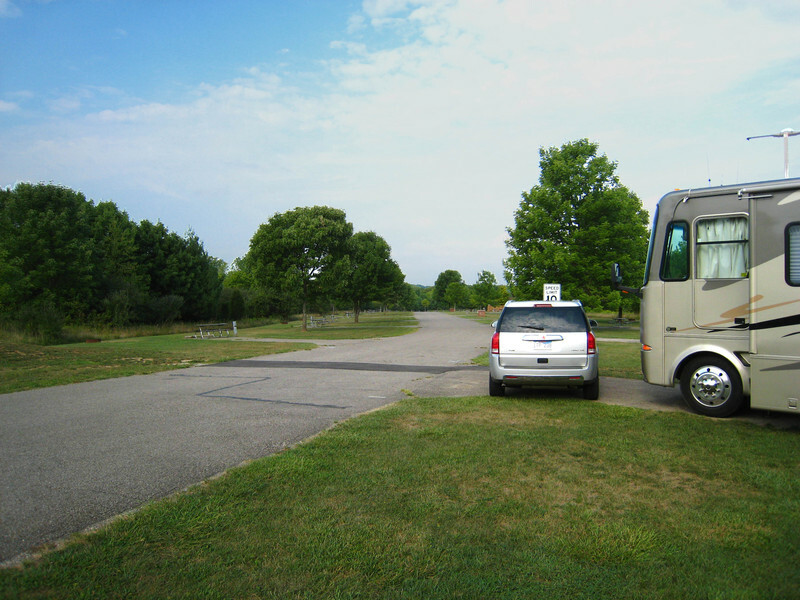 At the end of the visit, we had reservations at Scenic Hills RV Park in one of our favorite locations - Berlin, OH. On Friday, we all took off for Ohio - us in the motor home and Lora and J. Michael with their trailer. Berlin, OH is located in Holmes County, which has the world's largest Amish population. We love the hard-working nature of Amish and the beauty of their farms. In Ohio, the Amish seem less hassled by the tourists than they are in Lancaster, PA, and therefore are more open and friendly. 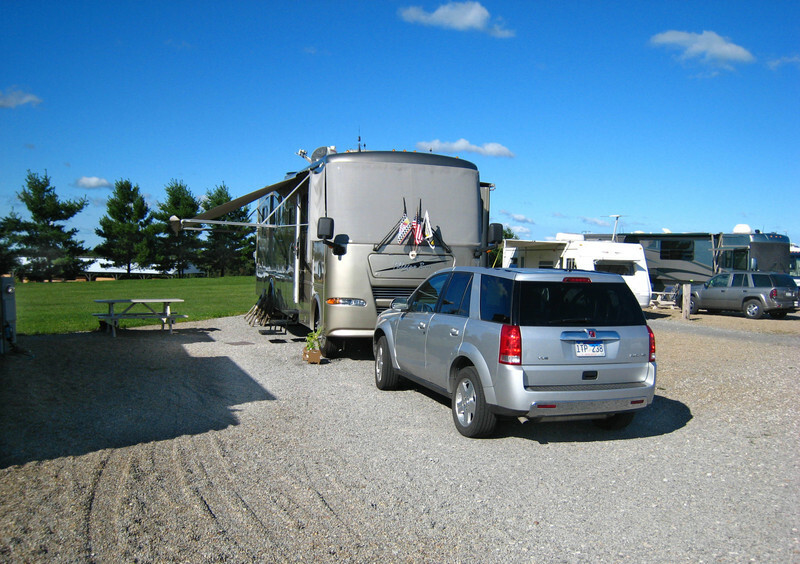 Scenic Hills RV Park is a nice campground with fairly large sites for a private campground. Although there are a few shorter sites, big rigs are no problem for the majority of the sites. There are three main areas - on the hill overlooking the rest of the campground, at the entrance level where the office is located, and the lower area. The entrance level sites are all gravel while all the others are grass with gravel pads. 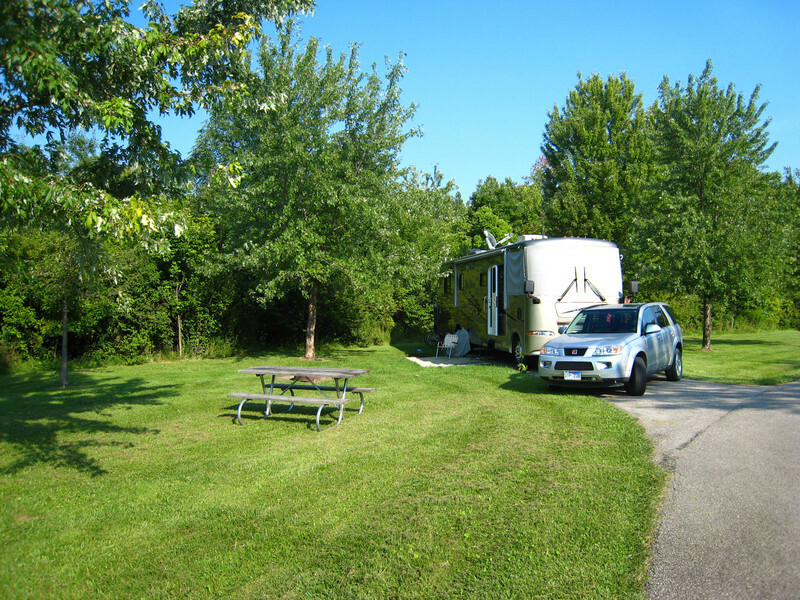 The campground is well kept and the owners are constantly adding sites and making improvements. There is a new area of premium sites just added this year. These are extra large and will soon have concrete pads. All sites have full hookups and there is free Wi-Fi and free firewood. There are no bath houses, laundry, or restrooms. 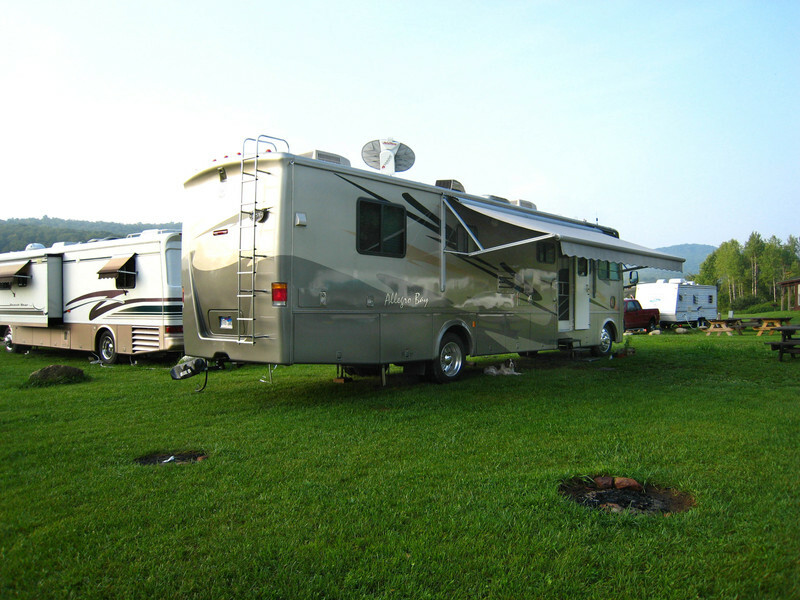 Scenic Hills is for self-contained RVs only. 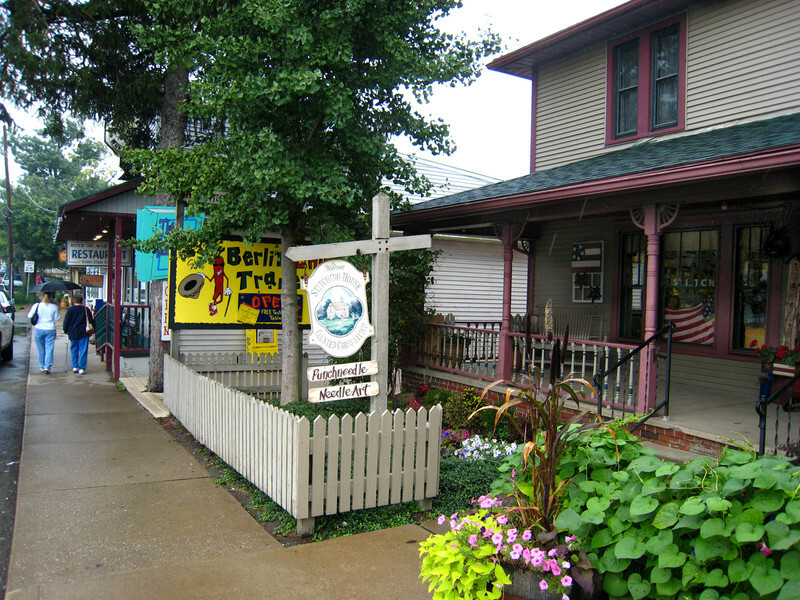 Berlin seems to be the center of the tourist area, but there are several other towns worth investigating - Sugarcreek (the "Little Switzerland of Ohio"), Winesburg, Charm, Kidron, and Walnut Creek. 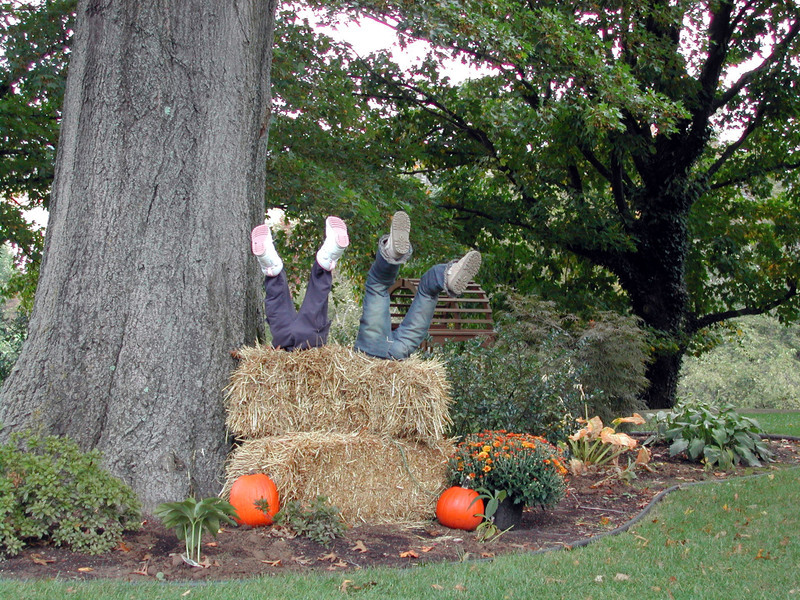 The entire area is loaded with bed and breakfasts, restaurants that serve "Amish home cooking," antique shops, craft shops, quilt shops, and furniture stores. The photo below shows some of the picturesque shops along main street in Berlin. Most of the furniture and crafts are locally made. In addition to the commercial shops, many Amish farms have a sign at the end of the driveway advertising crafts or furniture. If you're interested, don't hesitate to go up the driveway. They will be glad to have you come in to look around. Several years ago we consigned to have Lora's hope chest made and this trip Paul got a beautiful embossed leather belt. Of course everything is hand crafted and the prices are very reasonable. Just don't expect to visit an Amish shop on a Sunday since they do not sell on Sunday. In fact, all the shops and restaurants in the area will be closed on Sunday. Nearby, Walnut Creek has the original Der Dutchman Resturant, so we always make time to eat there at least once. They have a wonderful breakfast buffet Monday - Saturday and a terrific salad bar for lunch and dinner in addition to a menu that includes all the Amish specialities. There are several cheese factories in the area. We think Heini's Cheese has the best samples, but we also like Walnut Creek Cheese because they have a nice grocery with Amish-style foods, bulk foods (including Paul's favorite ju-ju fish), and a gift shop. There are a couple of great butcher shops in the area - Winesburg Meats and Sugar Valley Meats. Sugar Valley has the best smoked beef jerky, and Winesburg has superb beef snack sticks. There are also candy shops, bakeries, produce stands, and an orchard. Wow, we have to be careful not to put on weight when we visit here! After the Saturday breakfast buffet at Der Dutchman, we usually stop at the Amish Flea Market. The majority of the flea market is indoors and is open Thursday, Friday, and Saturday. They have a nice selection of mostly new items. Again, as full-timers, we don't buy much....except books; but it's fun to look. Another interesting stop is Lehman's Hardware in Kidron, OH. Lehman's stocks many non-electric appliances such as gasoline-powered wringer washers for the Amish as well as hard-to-find tools, farm items, home canning equipment, wood stoves, etc. It's really fun to look around. Did you know they still make washboards? Margery's favorite quilt shop is Miller's Dry Goods located in Charm. With over 5,000 bolts of fabric (including a great selection of Thimbleberries fabric), an extensive selection of sale fabric in the basement, many quilting aids, and a separate building for finished quilted items and many, many quilt books, quilters will have the time of their lives. Suggestion to spouses....bring something to read and enjoy the seats on the front porch. On Wednesday, the rain let up, and we left for our next stop in Onoville, NY so Margery could meet up with some old high school friends. On the way, we stopped at Ryers Shoes in Sharon, PA. Ryers Shoes claims to be the "world's largest shoe store" and was the reason for the originally-planned stop at the Shenango Corps of Engineers Campground that we skipped because of the rain. Paul has a difficult time finding shoes because of his unusually wide feet and Ryers has a really good selection of shoes including extra wide. We were able to find plenty of room to park the motor home in their lot, find a pair of suitable shoes in short order, and continue on to New York. In Onoville, we stayed at Onoville Marina. 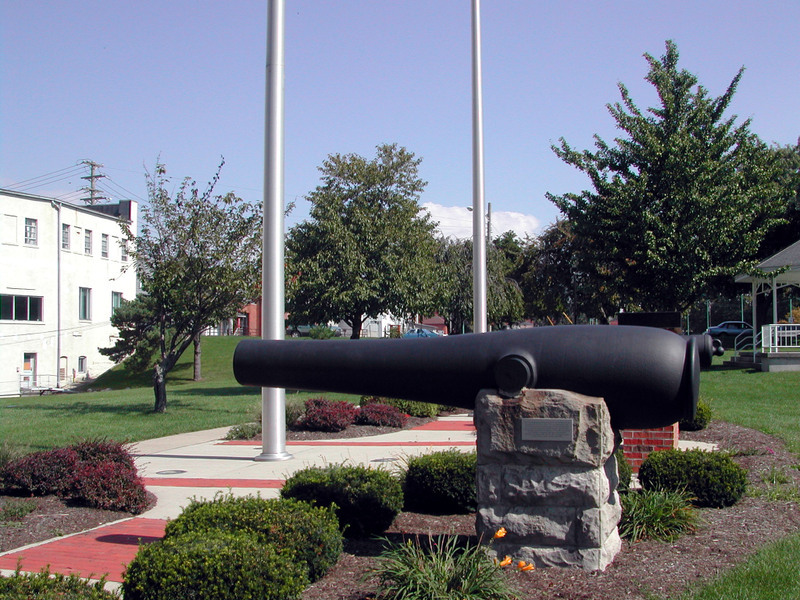 Onoville is located in western New York on the northern part of Allegheny Reservoir. The marina has a nice campground with both shaded and grassy, open sites. Thankfully, the grass was surprisingly firm in spite of the recent rain they had. The campground was quiet when we were there in the middle of the week, but judging from the number of boats docked at the marina, it probably fills up on the weekend. 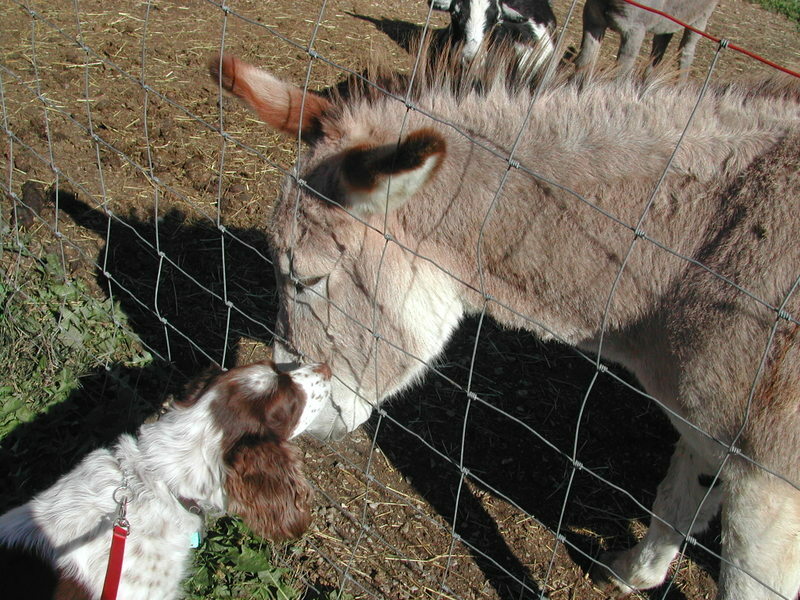 We had a good time visiting with Margery's friends. We had re-connected through Classmates.com. Margery connected with an old boyfriend, and a mutual friend connected with Margery. Imagine the surprise of Margery's two friends to learn they lived in the same area! After being the conduit for them to re-connect, they invited us to visit. They went out of their way to make us feel welcome and to show us around the area. It was fun reminiscing and catching up on 40 years of life. We were reminded what a small world it really is. We had common denominators through Margery's brother; churches; Jumonville, a Methodist camp in Uniontown, PA,; a Christian school, and former co-workers. Sometimes we were aware of those connections. Other times, our paths came close to crossing without our being aware. We ran some errands in the Amish area just northwest of Onoville. We were struck again how hard the Amish work and how different Amish communities can be. This one in New York is not as prosperous as Lancaster, PA, or Holmes County, OH. 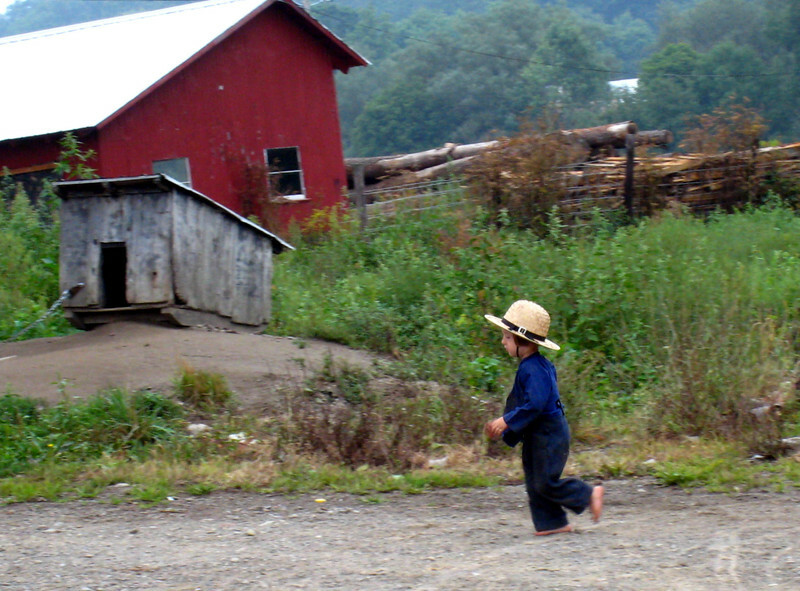 At one of our stops, we ran across this little Amish boy playing. We were also surprised to learn that we were staying on the Seneca Indian Reservation. This reservation was not as obvious as the ones out west...the signs were more subtle. We did see an Indian school whose name Margery originally thought was Swedish. :) They are also in the process of building a residence for a few of their senior adults. Whenever you see a purple sign while driving across the southern border of New York, you'll know you're in Seneca country. 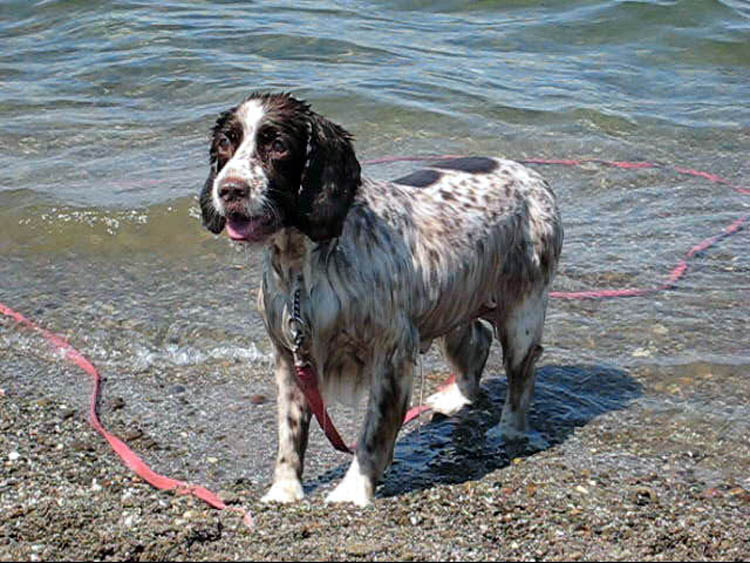 After Onoville, we headed west to Geneva State Park near Geneva-on-the-Lake, OH, located on Lake Erie about half way between Cleveland and the PA state line. 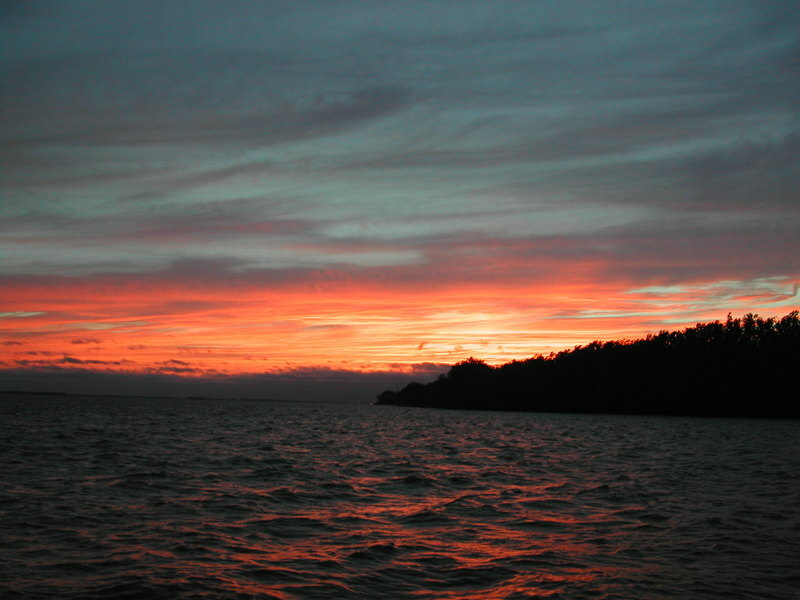 Geneva State Park was always one of our favorite campgrounds before we went full-time. It has spacious sites (although a few pads are a little short), and it is usually nice and quiet, even on the weekends. The non-pet sites are mostly heavily wooded and the pet loop has nice grass and some shade. 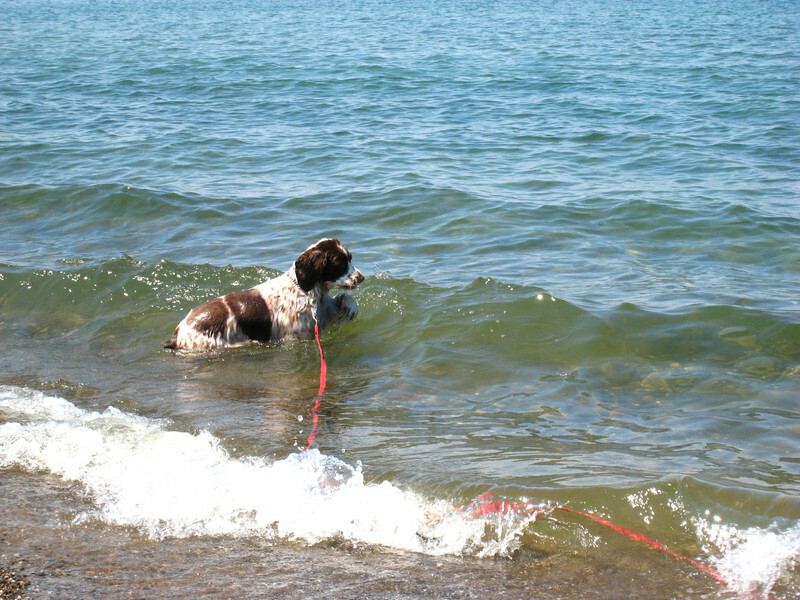 The state park also has a beach a short distance down the road where Molly likes to swim. 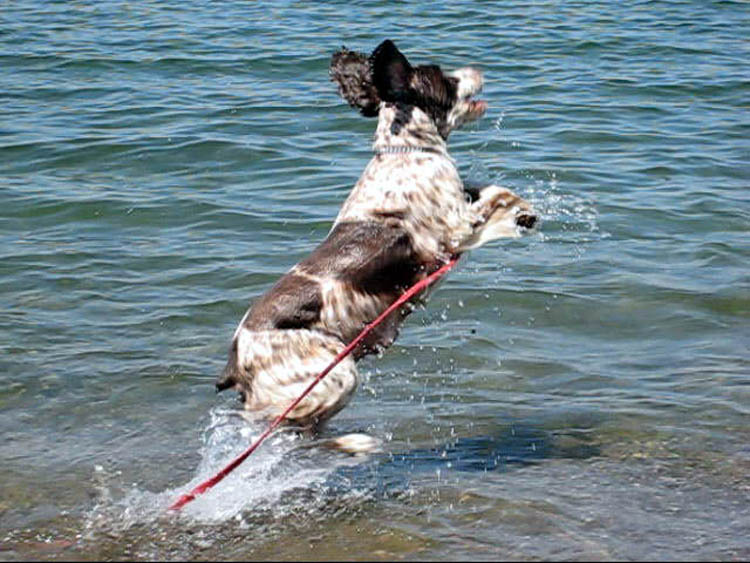 Pets are permitted outside the guarded swimming area. 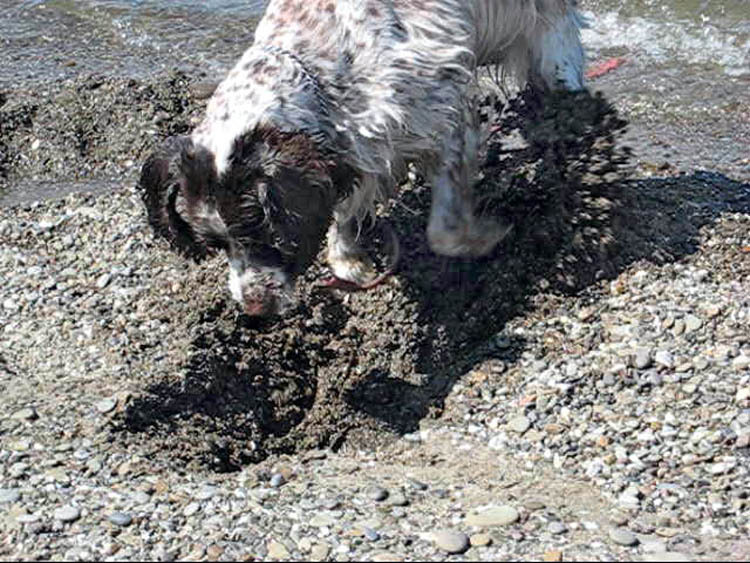 The walk across the large, sandy swimming beach has become more difficult for Margery, but we found a secluded beach with a little more gravel where Margery could walk more easily and where Molly could swim to her heart's content. 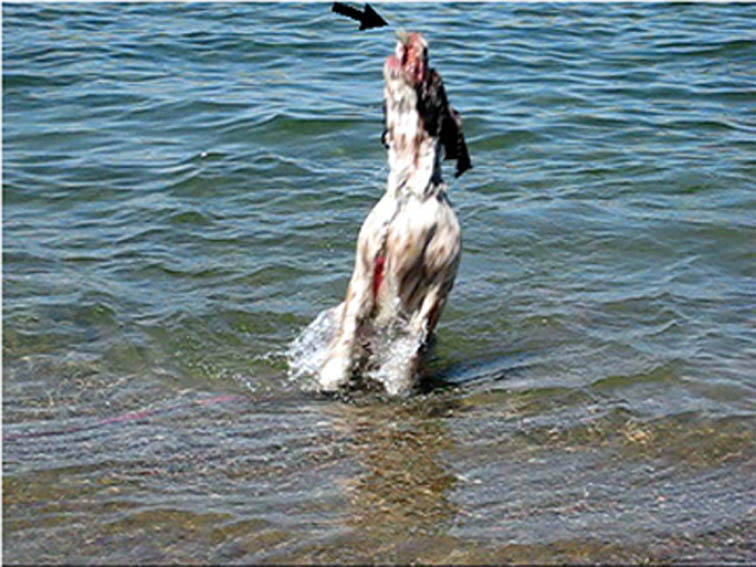 and sometimes it's a catch...and then pit-tuey! And when she's done playing, a smile of satisfaction. Nearby in Madison, OH is Sands RV Parts. In addition to selling RV supplies and accessories, Sands buys out inventory from RV dealers that are cleaning out their parts departments or that are going out of business. They have a huge selection (which changes over time as things sell out or as new stock comes in) of parts for older RVs as well as some for newer RVs. We love to look around just to see what they have...which seems to be EVERYTHING. ...and after the campground filled up on the weekend. The campground was very quiet for how full it was. Lora's college roommate and family were also joining us from Lexington, KY. This friend provided Lora with "wedding coordinator" services as a wedding gift, and we felt like it was a gift to us as well. We were able to relax and enjoy all the nuances of the day that we surely would have missed if we had had to be involved in the details. Over the weekend we once again had the breakfast buffet at Der Dutchman Restuarant in Waynesville, OH and then went to Caesar Creek Flea Market. We spent the rest of the weekend relaxing and talking. We enjoyed our visits with family and friends; camping with family; and stops at favorite, familiar haunts. Now it's time to move on again. Our plans for the near future include stopping by the big RV show in Hershey, PA on our way to the Amish country around Lancaster, PA. From there, we will be heading south; but our path and schedule are still undetermined. Recently. while having my hair cut, the stylist wanted to know why we decided to full-time in an RV. This morning we received this link to My Beautiful America that pretty much sums it up. We have not yet seen it all. :) And we are once again reminded how precious our freedom is and remember with gratitude those who have sacrificed so much so that we can continue to enjoy it.